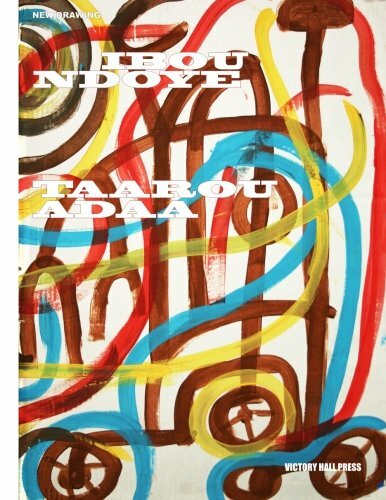 TAAROU ADAA is a Wolof (Senegal) phrase that means "the beauty of art or culture". Wolof, the native language of artist Ibou Ndoye, is credited with adding such colorful, casually insightful words to our culture as 'jive', 'dig', 'jamboree', and 'hip' or 'hep-cat'. The origin of this last, coming from the Wolof word 'hepikat', "one who has his eyes open" or "one who is aware"- captures best the spirit of these drawings. The artist sees more than we see in the everyday world we share and turns common sights into amazing, animate, icon-like forms; creating a lively sense of beauty in TAAROU ADAA. Ibou Ndoye creates beautifully primal, vibrant books of images that spring from his West African roots and reflect all the bustling energy of his experience of the NYC area. This publication is a reproduction of a unique book on cardboard made by Ibou Ndoye in 2011 created with acrylic and latex paints and drawing materials. New Drawing presents series of innovative, current images from artists whose work explores the visual and conceptual language of drawing. About the AuthorIbou Ndoye blends his West African culture with his immersion in urban life in the NYC/Jersey City area to produce art and narratives that are both relevant and rooted in his strong sense of artistic and social heritage. Born in Dakar, Senegal, he became active as an artist there in the 1980s painting murals and making paintings on glass as part of the Set Setal movement.. Moving to the US in 2001, he continues to be an active presence, sharing his talent through exhibitions, workshops and classes in a wide variety of institutions including schools, museums, adult day care centers, homeless shelters and libraries from Brooklyn to Philadelphia.